This page is for the 2013 re-release. 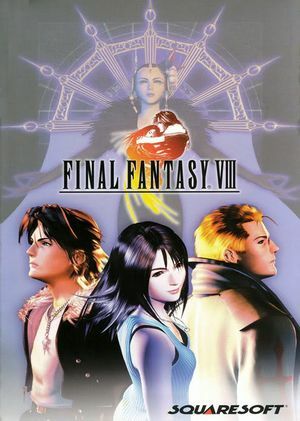 For the original 2000 version, see Final Fantasy VIII. 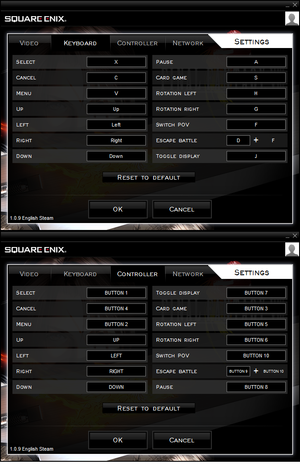 Replaces the default MIDI music with higher-quality tracks, similar to the PlayStation version. If you want orchestral music remixes, use Roses and Wine. Alternatively, the PlayStation Music Mod (Easy Fix) is a very simple file replacement mod that adds the original PS1 music, and has a much more straightforward installation process. However, unlike the above two mods, this mod won't fix the issue with music restarting from the beginning when you go to battle and then return to controlling your character. Replaces the blurry FMVs with better encoded versions based on the original PC release coupled with the uncompressed PlayStation audio. Fixes the incorrect sounds during the GF Quezacotl's summoning animation. Tonberry Enhanced is an essential mod which adds external texture support. This may cause issues with the Steam Overlay and the game may crash so disable it. Project Eden or Project AngelWing - Filters and upscales the pixelated backgrounds. Please note that some backgrounds are not perfect and have some graphic problems. Tripod - Adds HD Triple Triad card game. SeeD Reborn - Updates many elements of the HUD such as the title screen, font, textboxes, character art and battle/menu icons. If you dislike the textbox font that comes with 3.5, simply copy the "sy" folder from the 3.2 download. Alternatively, consider PS1 inspired fonts. Textbox color can be changed in the "ic" folder by editing both of the middle bars in "iconfl00_14" in the "iconfl00" folder, and "iconfl01_14" in the "iconf001" folder. Rebirth Flame - HD character textures for the main cast. BattleFieldPack - HD battle fields. BattleFieldPack - RECUT EDGES/COLOR BOOST - HD battle backgrounds with color boost. HorizonPack - HD world map textures. Lunar Cry - HD enemy textures. Apocalypse - HD boss textures. Project Hellfire - HD GF textures. La Magica - HD magic and limit breaks textures. FMVs from the original PC release were re-encoded from 480p Bink format (with tons of macroblocking) to 720p VP8/OGG with additional post-processing resulting in a blurrier look. See FMV Replacement Pack for a fix. 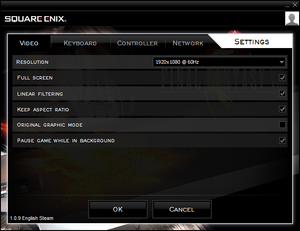 Menu screens are capped at 60 FPS, combat and FMVs are capped at 15 FPS, and everything else is capped at 30 FPS. To run from battle, hold L3 and R3 (analog sticks). Ctrl+R resets the game to the title screen. Movement restricted to first two axes. Launcher has no controller navigation support. Use Button prompts mod for Xbox/DualShock buttons. Entire game pauses when put in background. Can turn on/off. ↑ 1.0 1.1 File/folder structure within this directory reflects the path(s) listed for Windows and/or Steam game data (use Wine regedit to access Windows registry paths). Games with Steam Cloud support may store data in ~/.steam/steam/userdata/<user-id>/39150/ in addition to or instead of this directory. The app ID (39150) may differ in some cases. Treat backslashes as forward slashes. See the glossary page for details. Magic Booster, which increases the inventory of various spells by 100. Chocobo World, a mini-game previously found in the Pocket station port of the game. Steam Cloud and achievement functionality. ↑ Steam Forums :: Frame limit - any chance of getting rid of it? This page was last edited on 12 April 2019, at 18:22.